Student vote considered reflection of Arab political climate. For the third consecutive year, Hamas won the most student council seats at Birzeit University, seen as a gauge and beacon of PA politics, yesterday (Wednesday) in Ramallah, reported Middle East Eye. Ahmad al-Ahmad, in charge of student affairs, announced the election results saying that Hamas’ al-Wafaa Islamic Bloc won 25 seats with a total of 3,778 votes, followed by Fatah’s Martyr Yasser Arafat Bloc, which won 22 seats with 3,340 votes. The Progressive Democratic Students Pole (al-Qutub), the student arm of the leftist Popular Front for the Liberation of Palestine (PFLP), came in third with four seats with a total of 615 votes, while the rest of the competing student factions did not win any seats. Al-Ahmad said that 8,032 students out of 10,859 participated the election - a 74 percent turnout. Arab political observers closely watch Birzeit student elections. The university is a hotbed of political activism, and the student vote is considered a reflection of the political climate among Arabs inhabiting Judea and Samaria. 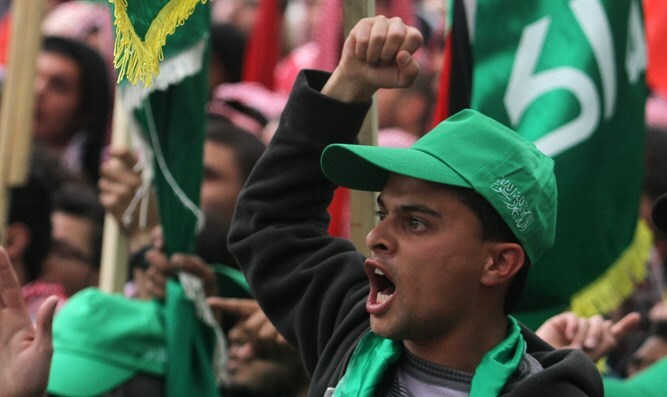 Hamas congratulated its student body, other student blocs, and the university. Abdulrahman Hamdan, Hamas’ spokesman, dedicated the victory to past Hamas student council leaders and jailed Hamas students, and paid tribute to hunger-striking murderers inside Israeli prisons, specifically the leaders of the prison protest, Marwan al-Barghouthi, Ahmad Saadat, Abbas al-Sayed and others. Hamdan told Middle East Eye that Wednesday's win was the result of the Islamic Bloc’s dedication to students. He said the victory was based on what the bloc “has provided to the students during the past few years, from financial support and other cultural activities”. “This result is proof that good work pays off, especially if the students are politically alert and educated like Birzeit students,” he added. “I voted for Hamas because they were working so hard with the students in the past year. They activated several committees that were not effective during the Fatah presidency of the student council,” said Mariam Salim, a math student. Waseem Ayoub, a Fatah spokesman, congratulated Hamas and described the election as "a democratic wedding," saying he hoped a similar experience would be allowed in Gaza next year.